The 45 ACP is one of my favorite handgun cartridges and I suspect it’s one of yours as well. It was developed in the early 1900s to remedy perceived terminal performance deficiencies in the 38 Long Colt revolver cartridge then being used by the United States military. The thought is that if you are hamstrung by legal conventions into carrying only non-expanding ammunition, then 45 ACP is a great choice for you. 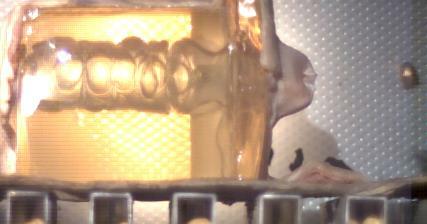 The larger diameter of this bullet will increase fluid drag when compared to a smaller bullet—all else being equal. 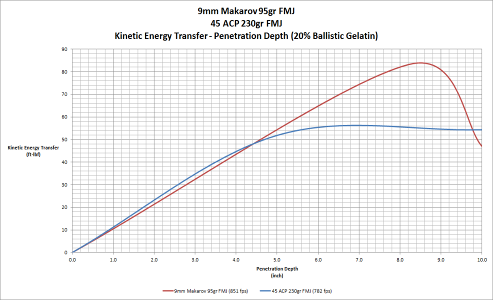 Let’s take a look below at how the fluid drag acting on the 45 ACP 230gr FMJ compares to the fluid drag acting on a 95gr FMJ shot by a 9x18mm Makarov cartridge (see Figure 1). That red line on the top is the 9mm Makarov FMJ and the blue line below it is the 45 ACP. The larger diameter 45 ACP has a slightly higher fluid drag because of the larger diameter but this all changes when the 9mm FMJ ‘throws on the brakes’ when it turns sideways. I expect the 38 Long Colt and its longer lead round nose bullets to perform similarly to the 9mm Makarov FMJ with greater kinetic energy lost in the target. 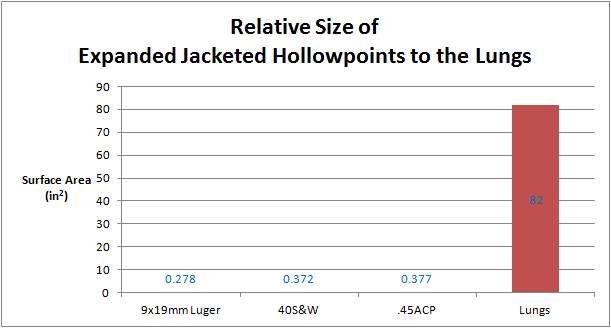 Luckily, most people are able to obtain jacketed hollowpoints for self-defense use. Using JHPs is where the 45 ACP really begins to shine. In order to give you a feel for the difference between ‘hardball’ and JHP from the same handgun, freeze frames from the Simulated Shotlines series will be presented below (with links to the slow motion video that corresponds with the shot). Discussion of the 45 ACP seems to naturally drift into a discussion of the 1911, the gun originally designed to shoot this round. So, I will talk about it now as well. You must hit the target in a vital area, oftentimes repeatedly, if they are planning on saying around and fighting. It has been said that most criminals will run away once you begin to resist them. What about the criminals that know you are the witness to them perpetrating a heinous crime? They have a great incentive to stay around and fight you. This is where I believe there is a great advantage with the 1911 and other single-stack 45 ACPs firearms. The fact is that they don’t hold as many shots as the double-stack magazines like what you would find in a 9mm Luger or 40 S&W handgun. With less rounds available, it would behoove the shooter greatly to aim more carefully and hit their target solidly with every shot fired. There is a fine balance between the precision of a sniper and the spray-n-pray tendencies of many people who should know better today. Versatility is built-in to the 45 ACP in that you can use it for relatively easy recreational shooting, self-defense and even defense against dangerous game animals. There are situations in which 45 ACP can be used for hunting, but it is only ethical to engage in such activities if you are a skilled pistol shooter. The operating pressure of the 45 ACP is 21,000 PSI. Pressure is force divided by area. So the force driving the bullet is the area of the base of the bullet multiplied by the pressure. Increasing the pressure, congruent with common sense also, increases the force acting on the bullet. Force is the mass multiplied by the acceleration and acceleration is very important in handgun barrels (more so than with rifle barrels) because there isn’t much time for the gas pressure to drive the bullet out of the barrel. Owners of a suitable 45 ACP handgun should check into having it converted to 460 Rowland. 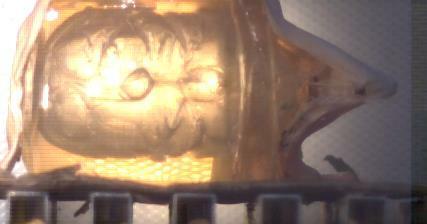 This will increase your chamber pressure to 40,000 PSI. It is critical to have your gun professionally converted because factory 45 ACP firearms are not able to handle the increased slide velocity and pressures of this cartridge. Pictured to the left is Jerry “Mad Dog” Shriver. He was a member of the Studies and Observations Group though as you might have gathered from the photograph, the purpose of SOG was quite different from the apparent meaning of the acronym. In his hands is a special M3 Greasegun fitted with a Bell Laboratories integral silencer. 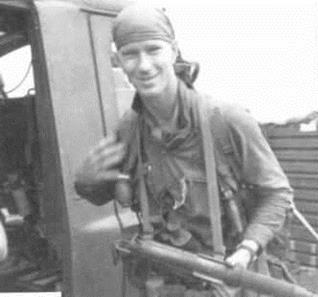 Submachineguns in 45 ACP are second only to the shotgun in terms of dominating close combat situations. There are many choices available to the gun owning public if they wish to own a long arm chambered for 45 ACP. Through the years there have been ‘civilian copies’ made of the UZI and Thompson Submachinegun as well as the AR-15 and even an M3 Greasegun. I strongly recommend that you shoot any such gun before you buy it. The UZI, M3 and Thompson SMGs are all open-bolt weapons which means that the bolt carrier is locked rearward and pulling the trigger causes the bolt carrier to be released. This pushes the cartridge into the chamber, lurches the gun forward and fires the cartridge in rapid succession. The drawback to the commercial semi-auto replicas is that they are legally required to fire from the closed-bolt position. Economic reality dictates that manufacturers must reuse as many of the full-auto parts as possible because the market that they will serve with the semi-auto only replicas is small in comparison to the very lucrative military market. Most commercial pistol caliber semi-autos, then, fire from an unlocked closed bolt position. That means that the only thing keeping your face and arms from a spray of metal and hot propellant gas is the weight of the bolt carrier and the strength of the recoil spring. I mention that not to attempt to Chicken Little you out of firing one, because they are quite safe. The issue I have is that such a configuration does not lurch the gun forward as does the open-bolt, military cousins of these carbines. This means that the recoil spring must be excessively strong as the spring will exert the least amount of force possible while the bolt is fully forward—exactly when you need the spring pressure and bolt weight to be maximized in order to keep the firing cartridge in the chamber until the chamber pressure has decreased to a safe level. The bolt carrier itself is more massive than in the open-bolt versions, sometimes as much as 30% heavier. The increased weight leads to a sharper felt recoil. Having shot the semi-auto, closed-bolt 45 ACP UZI extensively, I can compare the recoil to that of a 6.8mm SPC AR-15. The 6.8mm SPC, which is always shot from a locked breach firearm, is much more gun than a 45 ACP but the felt recoil is about the same. Notice the increase in rearward velocity of the UZI when using a sound suppressor. This is not to be held against silencers—everything in life is a compromise. Barring some sort of technological advance in the area of recoil suppression, significant reduction of the muzzle sound signature will increase your bolt carrier velocity, visual signature (the puff of propellant gas) at the ejection port and will increase the amount of propellant fouling inside of the firearms action. What I would like to see become commercially successful is displayed at right. 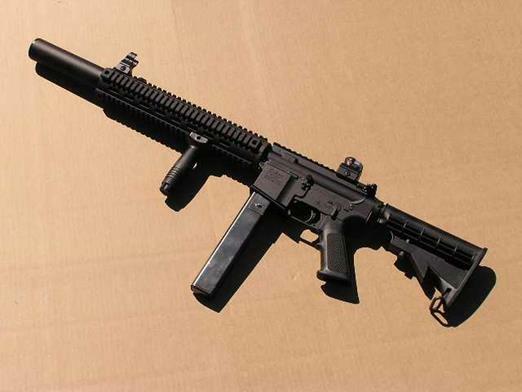 It is a AR-15 lower receiver that is custom-made to fit an M3 greasegun magazine. If your ‘conversion gun’ needs something to be welded to the magazine to fit in your gun … not only are you carrying useless weight but I wish you the best of luck in finding magazine pouches for the extra ammunition that you should be carrying. The mechanism should be a direct-impingement system, a gas-operated weapon like the M16 and AR-15. This way, the recoil is much softer and the weapon is much more controllable during rapid fire. What I like about the design at right is that the lower receiver has been custom made to fit the Greasegun magazine. The AR-15 magazine well was originally dimensioned to fit magazines containing 223 Remington cartridges. Most pistol caliber adaptations require a spacer to be welded onto the magazine to fill the space or a spacer that can be released accidentally by reflexively pressing the magazine release. At close range, a pistol will penetrate further in common household barriers than will an assault rifle. This may come in handy if for home defense. In a world largely defined by hodge-podge slapdashery, it is refreshing to see something like this that both serves a particular function better and that is planned to maximize performance and minimize weight. The 45 ACP is a robust, all-around cartridge. Ammunition selection for a 45 ACP (with a barrel length of 4” or greater) is easy. I would recommend the 185gr and heavier JHP bullets for self-defense against people and the 230gr FMJ, pushed hard, for last-ditch protection against dangerous animals. Short barrel pistols are quite sensitive to ammunition selection. I recommend that you have your ammunition shot from your gun into a ballistic media to find the optimum load for your gun. We test a 45 ACP compact and six different types of ammunition against synthetic bone plate and gelatin.